NOTE: This is a pre-production version. Design of the tail has changed in the final version! The box contains the light itself, two extra O-rings, split ring, and claw. Also this photo is from earlier version, thus showing also the larger claw. Features are quite simple: Main "feature" is that the light is so small that you can hook it to your key ring and forget it - until you need light. The light has two well spaced modes, about 3 lumens and 60 lumens. UI is very good, or actually the best for this kind of light: Tighten head to turn on (= low). Loosen to turn off. Turn off and on again for High. No memory means no unpleasant surprises and makes sure you won't lose your night vision by accident! Value for money: Good! Even though the light is a bit pricey, the small size, lower weight and good features are worth the price difference. Design is just prefect. The size is great for key chain use, and so is the material. Titanium can take even more abuse than stainless steel, which is needed when the light repeatedly hits your keys during the next few years. Titanium version is also very lightweight - even if I never had problems with the weight of SS version I think that the titanium version is more balanced in my key chain. Knurling is very nice, a bit more aggressive than in the SS version. Not too aggressive though => very suitable for a key chain light. 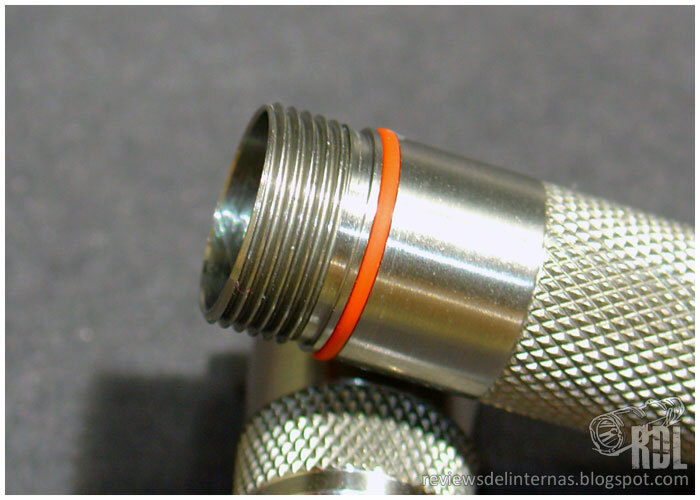 If I had to choose which knurling is better, I would choose this one. Here's a comparison to DQG III SS (Ti left, SS right). Please note how the knurling design is changed again a bit. This together with the more aggressive knurling seems to work well, as the light is very pleasant to operate, also with one hand. ..and the knurling of the body. Machined very well, I must say! A look to inside. Nothing there, not even a tail spring. The threads were very smooth, but dry. The first thing I did was applying some silicone grease and I was happy with the threads thereafter. The slot for O-ring is clearly separated from the threads also in the titanium version, helping to keep the O-ring in place and prevent damage. A small, but very important detail! Another important feature can be found on top of the driver board: A foam insert, which eliminates the battery rattle, also when turned off! Note also the machining quality: Very clean! The TIR lens is flawless and emitter perfectly centered. Weight: About 19g with lithium primary cell, split ring & claw (= ready to use), 9g without. And about 16g if you don't use the claw. Unbelievably lightweight!! The bottom line in the quality: Machining is near perfect, absolutely nothing to complain! And the included new, smaller claw is the best I have seen so far! I measured the current draw to be about 450mA on high and 20mA on low -> theoretical runtime would be over 2.5h on high and up to 50h on low (with a good lithium AAA primary). Current draw is significantly less than in my SS version and it seems to be also lower than the DQG II, which took about 540mA. Also the brightness on high is a bit lower than SS, but it's hard to notice unless you are using lux meter => maybe not full 60 lumens, but then again: Better battery life. I also tested the runtime with Energizer Ultimate lithium AAA (initially at 1.80V -> 3h down to 0.3V when the light was barely on): 2h 33min to 50% brightness. As we can see, the light is well regulated and maintains good brightness for about 2h 30min on high. Just what I want from a EDC pocket / key chain light! About 3 lumens on low -> enough for small tasks and doesn't ruin your night vision. On high the promised 60 lumens seems to be a quite accurate figure and is certainly enough for walking on a small path or similar. The TIR lens provides a really nice beam pattern, which makes the beam look even brighter than 60 lumens! The DQG Tiny II and III have been my favorite key chain lights since the famous BLF group buy. The only things I ever complained about it were the battery rattle and the fact that it eats O-rings. So I had really high hopes for the new version and it lived up to expectations. The stainless steel version was already very good, but if you want to have something even more durable and lightweight, the titanium is the way to go! I feel the price difference is not so bad, so I happily paid for the titanium and I'm very pleased with it. After all, this is my current EDC and thus the most used light. The End (pun intended). Note that the tail design will be different in the final production version. good to see .. you're as passionate about the DQG Tiny specimen as i am about the Tank E09 evolution (colors, V1, V2, V3, ..). i hope that the lights never die on you -- financially, i cannot afford such expensive lights if they die on me. i do afford such-priced lights if it's a premium brand with 10yrs performance guarantee (4sevens, eagle tac): if their lights fail to flash during normal use which includes drops from normal use heights, e.g. 3 feet, warranty covers the defect and repair. fenix has some good service after the warranty period too. Thanks for the review _the_! Very nice review, mate I know it's TI, but... veeeery pricey anyway (for me). Great regulation, btw. "Magnet in tail (or glow dot, the choice is yours!)" Ric said the magnet is better on the new tail, so the new tail will come with a magnet. Is there still a choice ? Ric really said at "the other place" that "As the magnet looks better on the new tail, DQG Ti will come with magnet." And thanks for all the compliments! Creating these reviews takes much effort, so it feels good to hear that someone reads and even likes them. Personally I feel like these lights are too much of a gamble given the (seemingly) lacking long-term support. If I'm gonna drop $50+ on a light then I want that 10 year warranty! Getting back to the review, did you experience any galling of the threads when rotating the head? Well. As I said, the threads were dry and I experienced some galling before applying the silicone grease, but after that the head rotates fairly smoothly. There is still a bit more friction than in the SS version, but that's nothing I would be worried about. About the price / warranty of budget lights: I have paid over $100 for lights that came without any warranty. That's always a risk when dealing with "budget" lights. But then again, similar light with warranty might cost $300-500, so I can get a spare one (or buy a new better model!) in case the old would break..
And paying $57 for a light that I use every day is not bad IMHO. Great review _the_ !! Awesome pics! I've just ordered one, with GITD and CW tint. I'll review it for the spanish community in my blog when arrives. Thanks for another excellent review THE! Very well done. Frontpage’d and Sticky’d. I received a notification last friday to pick up a parcel coming from SG post. I received my Ti a few days ago. I’m very satisfied. The threads are better than expected. Even better than one of my SS Versions. Thanks for another great Review UPz! I just found this thread now, but thanks for the write-up, very nice pics and review.